In this issue: Milwaukee uses art to bring attention to wastewater issues, Rhinelander keeps the School of the Arts flame alive, and the story of Janesville gets told. Dinner (on a train) is served and beer/biofuel research takes a step forward. 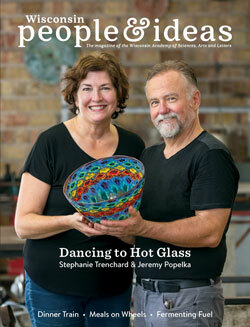 Hot, hot glass at the Popelka Trenchard Studio in Sturgeon Bay and Meals on Wheels feeds bodies and souls. A look at the genesis of the Writing in Stone installation at the James Watrous Gallery as well as book reviews, and new fiction and poetry from our 2017 writing contest winners.